St. John's Pearl Necklace with Sterling Silver Charm by M.LaHart & Co.
* Three Week Delivery Guarantee: Between April 16, 2019 and June 13, 2019, any qualified order for a High School Class Ring is eligible to receive our Three Week Delivery Guarantee. The upgrade guarantees that you will receive your High School Class Ring within three weeks of your order date (normally eight weeks). To qualify, you must be a high school senior, graduating in 2019, and you must use Promo Code 3WKHS when placing your order online. This offer excludes Journey Collection jewelry, our special Camo and Fusion finishes, and any special stones or cuts. Offer is not applicable to orders placed before April 16 or after June 13, 2019. Offer is only valid on Balfour.com. Gear up your school spirit with the gift of awesome NCAA and college products. 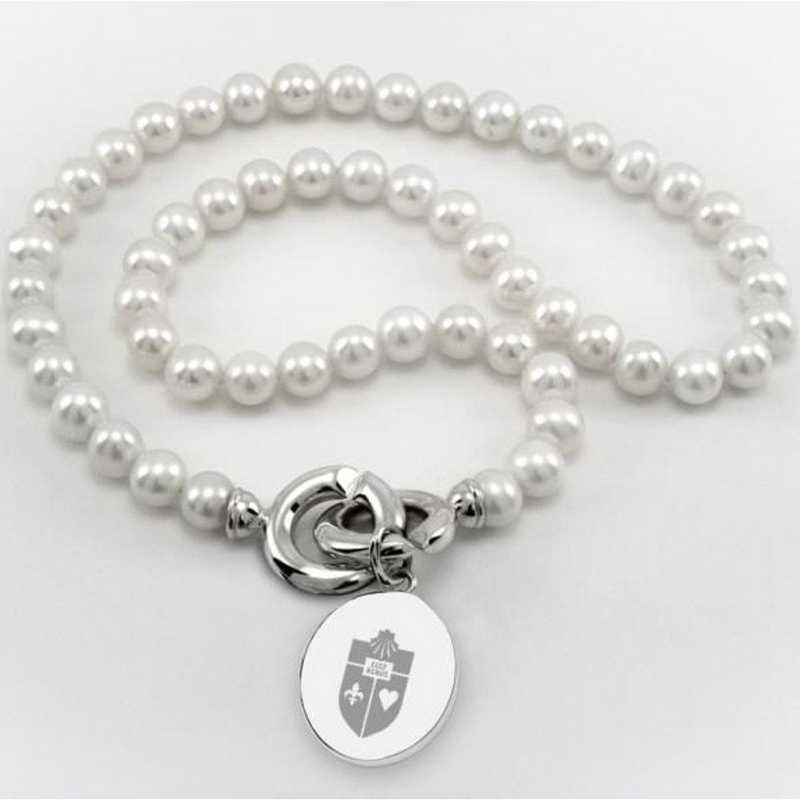 St. John's University pearl necklace and sterling silver St. John's charm features the St. John's shield finely detailed on front and interlocking "C" clasp., Pearl necklace measures 18" long; charm measures: .80" diameter., Freshwater cultured pearls (8mm). Finest grade .925 sterling silver., High-polish, rich luster finish., Attractive M.LaHart signature jewelry pouch and gift box., Combine with pewter trinket box, pearl bracelet, or other women's accessory for a unique gift set for your favorite new graduate or alumna. Officially licensed by St. John's University Manufacturer direct from a trusted supplier. You're reviewing:St. John's Pearl Necklace with Sterling Silver Charm by M.LaHart & Co.